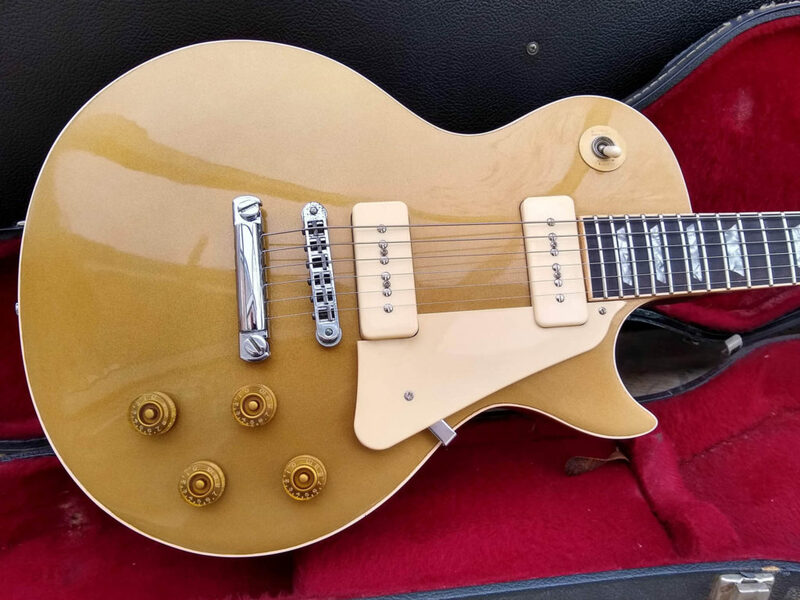 I was asked to refinish the top of this 1981 Gibson Les Paul Deluxe which was originally sunburst but had been “goldtopped” using what looked like car spray. 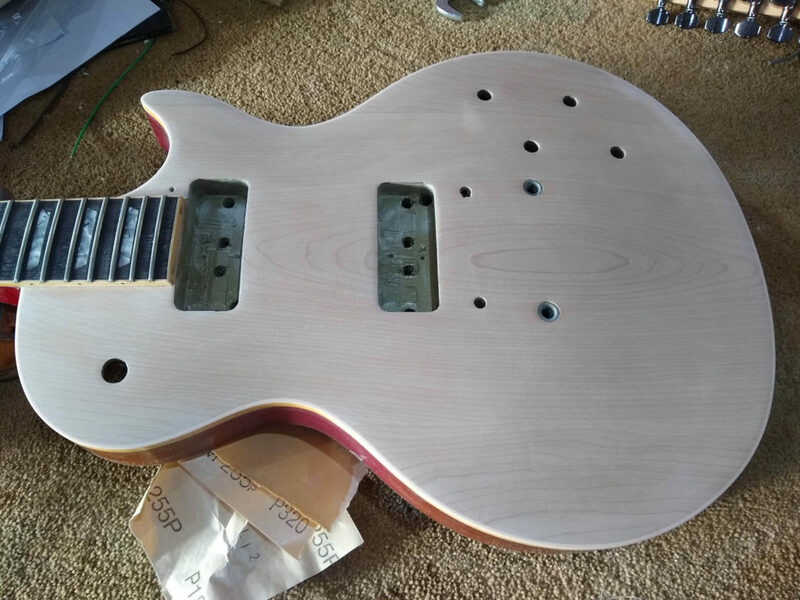 The colour was completely wrong and bizarrely, mini-humbuckers and P-90 pickups (which are the same size of course) would not fit in the cavities! The first step was to strip the top. I did this using a Black & Decket mouse sander to remove most of the paint and primer, then finishing along the grain of course using 320 grit 3M gold sandpaper to remove any scratches left by the orbital sander. I carefully re-routed the pickup cavities a fraction larger so that I could get the pickups in without fear of chipping the new finish. 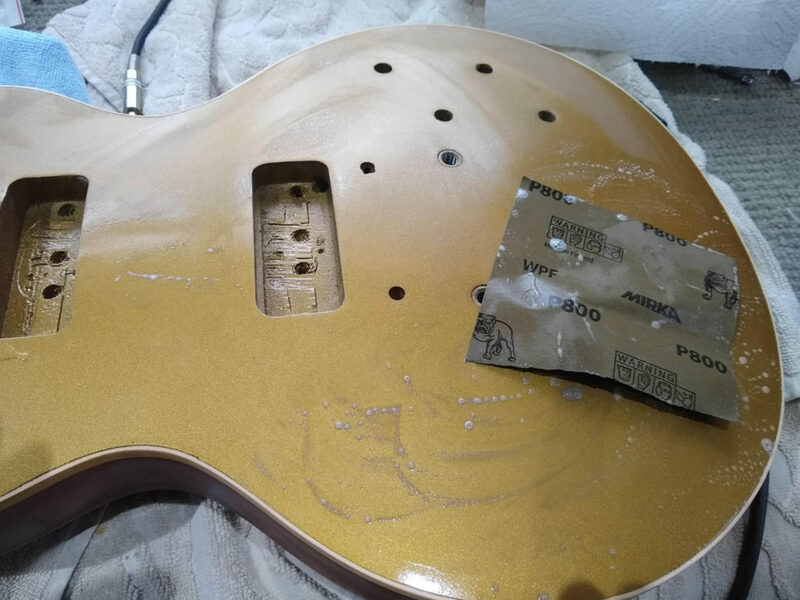 This was the most nerve-wracking part of the job – nobody wants a router slip on a vintage Les Paul! 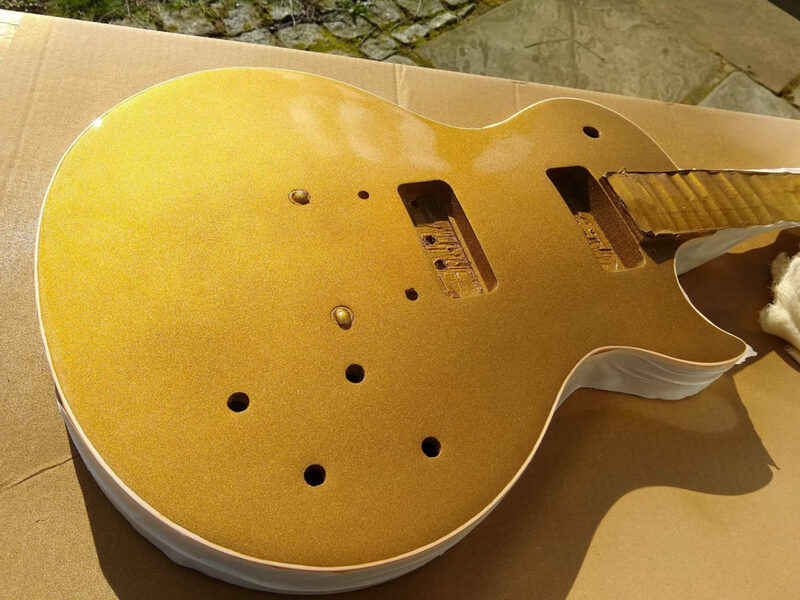 Once the top was sanded it looked really nice and would have been great with a natural or sunburst finish but it had to be a goldtop. I masked off the neck and sides and sealed the maple with a coat of Clear Gloss, denibbed and sanded again. 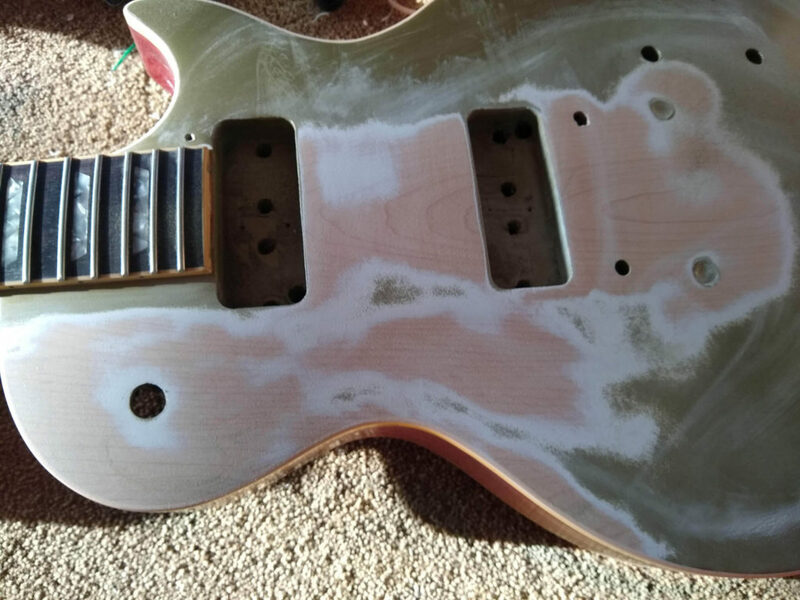 I would not recommend using primer on a bound guitar such as this as when the binding is scraped later it may leave a white line of exposed primer. 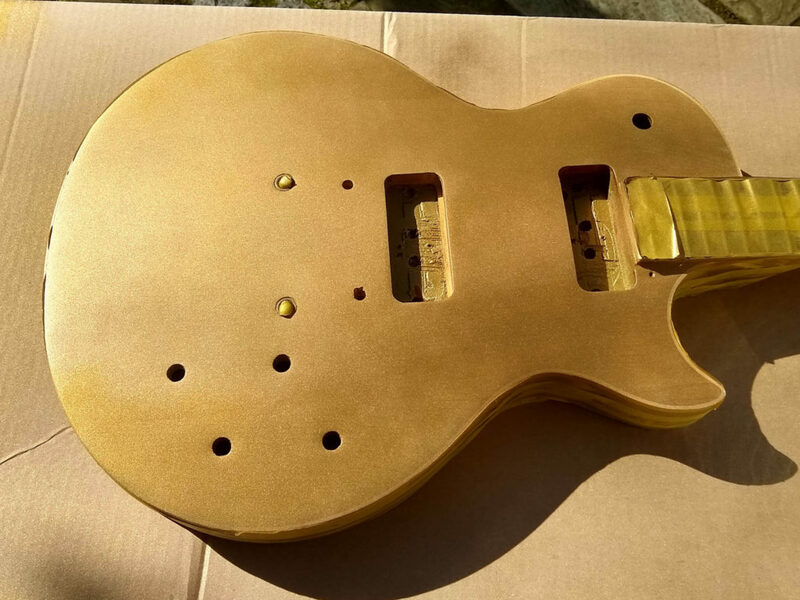 The next step was to spray the Gold Top lacquer. This takes a few coats to achieve a nice opaque covering. I was spraying outside on a sunny day and the lacquer really sparkled in the sunlight. The picture below was taken after the first coat and you can still see some of the maple wood grain showing through. 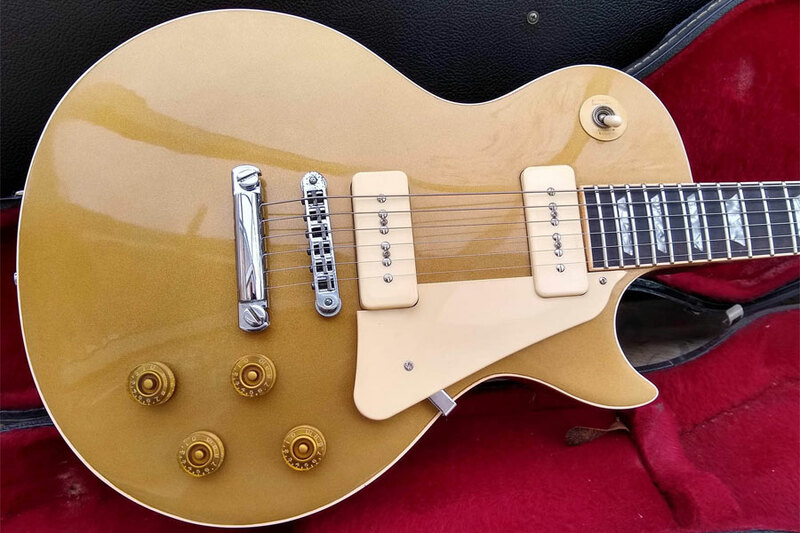 My Goldtop lacquer contains real bronze powder plus other pigments, just like the lacquer used by Gibson in the 1950s. I sprayed a coat of clear to protect the gold whilst handling and took it indoors to scrape the binding. It’s best to leave an hour or two for the lacquer to harden, but before the lacquer has become so brittle that it might chip. Scraping is fairly easy to do with a steady hand using a Stanley blade. It’s best to go slowly, taking off a little at a time until enough binding is exposed. Once that was done I remasked and sprayed the clear coats. It’s essential to get plenty of clear on so that there is protection from rubbing through when flat sanding. I put most of the rest of the can on. Once the clear lacquer was on I had to leave it a few days to harden before sanding and polishing. I started the flat sanding using 800 grit wet abrasive. This was coarse enough to remove the small amount of orange peel I had. I sanded until I had no shiny spots that indicated dips then went over again with 1200 grit, again wet. 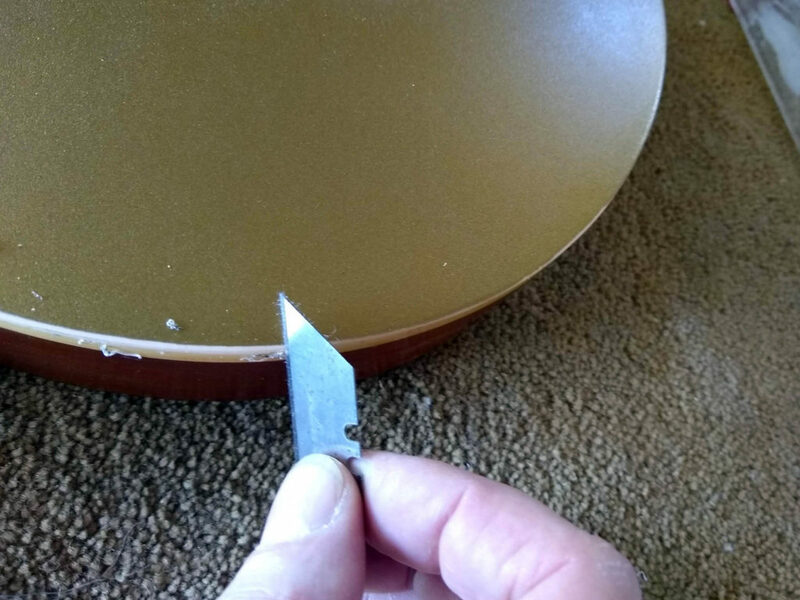 I had kitechen roll on hand and was very careful not to allow any water into holes in the guitar which can swell the wood and crack the lacquer. Once I was happy the the top was sanded I buffed using my favourite T-Cut to a shine before reassembling and setting up.